Through its Transportation Lighting and Safety program, the Lighting Research Center (LRC) at Rensselaer Polytechnic Institute is evaluating the potential for new LED light technologies and approaches to improve driving safety at night, including new car LED headlight systems. 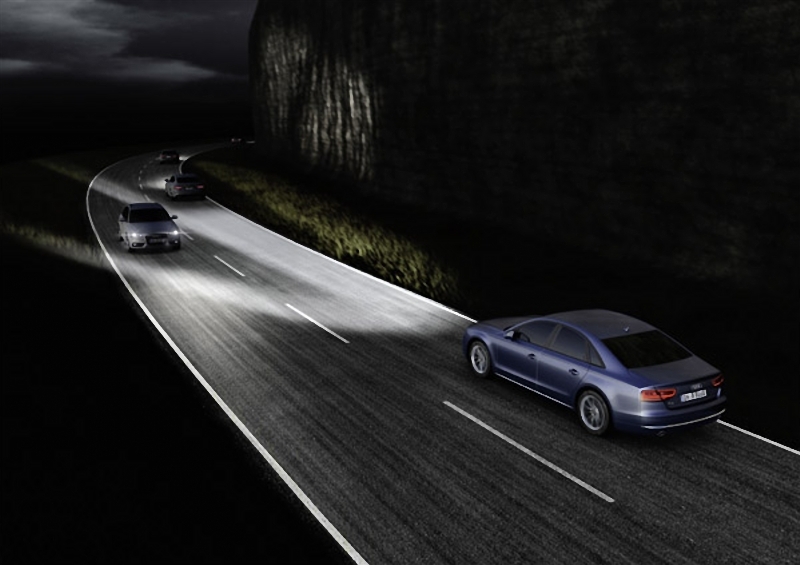 For the research, auto maker Audi AG has provided the LRC with an A7 equipped with adaptive high beam "matrix lights" that allow drivers to benefit from using high beams all the time while selectively dimming a part of the beam in the direction of other drivers to prevent glare. In the Audi system, the beam pattern is separated into numerous individual LEDs arranged in a grid or "matrix" that suits to the surroundings in real-time. The car LED light system is being evaluated by LRC researchers recently. LRC research for NHTSA demonstrated that forward visibility under adaptive high-beam LED light systems was comparable to that under high beams, while disability and discomfort glare for oncoming drivers were comparable to levels experienced when facing low beams. The results of a recently published LRC study of driver visual performance suggest that nighttime crashes might be reduced up to 7% when adaptive high beams are used, relative to low-beam LED headlights. Audi matrix LED headlights on the road. The research team, led by Director of Transportation and Safety Lighting Programs John Bullough and LRC Director Mark Rea, will evaluate the safety influences of these new adaptive high-beam car LED light systems, which are beginning to appear on international vehicle models. Current requirements for vehicle front lamps in the U.S. detail the photometric performance of low- and high-beam LED headlight patterns, and vehicles are required to have a set of low-beam and a set of high-beam LED headlights conforming to these specifications. Adaptive high beams have not been used on vehicles in the U.S. because the modifications to the high-beam beam pattern result in a pattern of lighting that does not conform with either the high- or the low-beam performance standards. Although these systems have been widely used in many countries, few tests have been made in the U.S. Through the LRC evaluations, Bullough and Rea hope to provide objective proof e that might be useful in assessing whether and how adaptive high beam systems might provide safety benefits compared to conventional vehicle headlights, and how to consistently measure and specify their performance. The study is sponsored by the Transportation Lighting Alliance (TLA), consisting of vehicle and lighting manufacturers Audi, Automotive Lighting, Hella, OSRAM SYLVANIA, Philips, and Varroc Lighting.